I illustrate this troubleshooting as it will be useful for some of you. I requested to one of the members of my Team to compile and to install ZFS 7.9 to some of the Servers loaded with drives, that were running ZFS 7.4 older version. Those systems were running RHEL7.4. The compilation and install was fine, however the module was not able to load. That was only failing in one of the Servers, but not in the others. And that confirmed my suspicious, so I edited /etc/zfs.conf and commented the parameter and tried again. And it failed. As I run modprobe -v zfs (verbose) it was returning me the verbose info, and so I saw that it was still trying to load those parameters so I knew it was reading those parameters from some file. I could have grep all the files in the filesystem looking for the parameter failing in the verbose or find all the files in the system named zfs.conf. To me it looked inefficient as it would be slow and may not bring any result (as I didn’t know how exactly my team member had compiled the code), however I expected to get the result. But what if I found 5 or 7 zfs.conf files?. Slow. strace is for System Trace and so it records all the System Calls that the programs do. That’s a pro trick that will accompany you all your career. 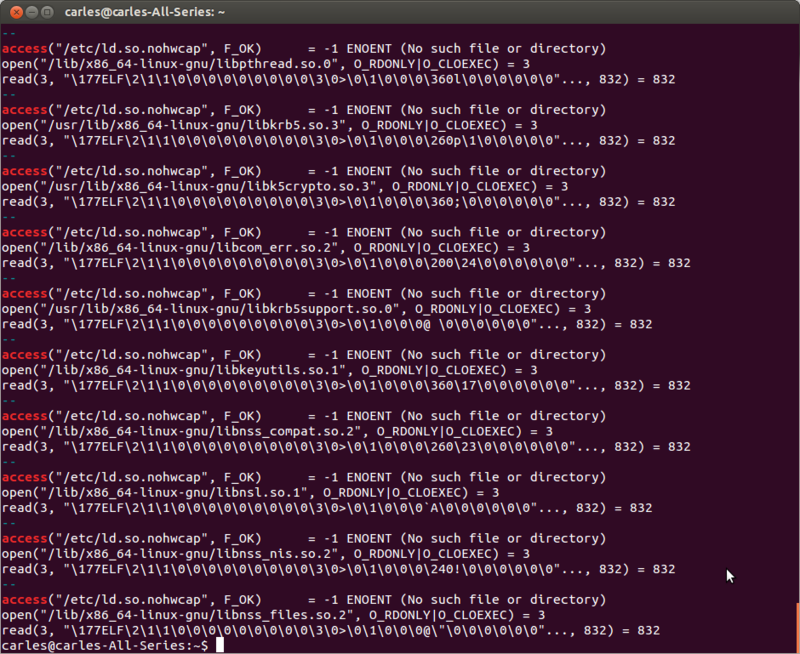 I did not use -v in here cause all the verbose would had been logged as a System Call and made more difficult my search. 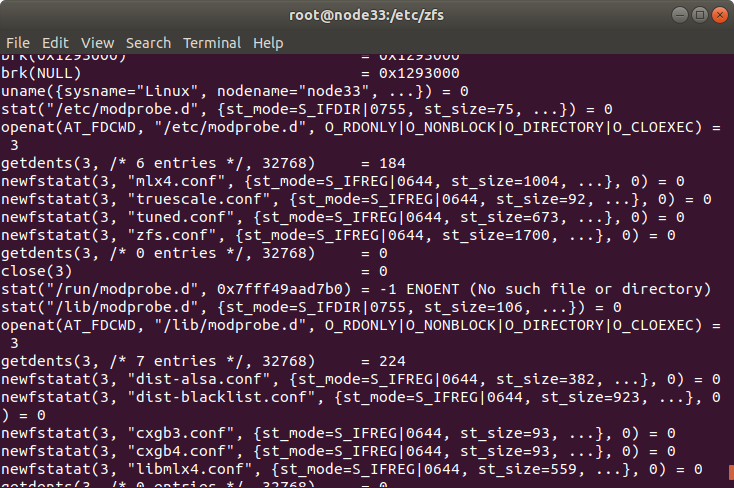 I got the output of all the System Calls and I just had to look for which files were being read. This entry was posted in Development, DevOps, Software development, Troubleshoot and tagged RHEL, strace, ZFS on 2018-07-03 by Carles Mateo. Let’s say you are on a system and a program stops working. You check the space on disk, check that no one has modified the config files, check things like dns, etc… everything seems normal and you don’t know what else to check. It could be that the filesystem got corrupted after a powerdown, for example, and one file or more are corrupted and this would be hard to figure out. To find whats going wrong then you can use strace. 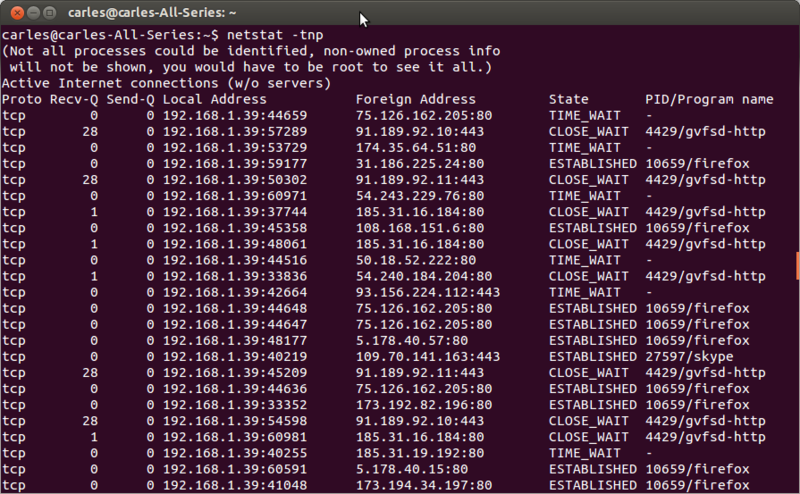 As you may know the programs request system calls, and get signals from the Operating System/Kernel. strace will show all those requests done by the program, and the signals received. 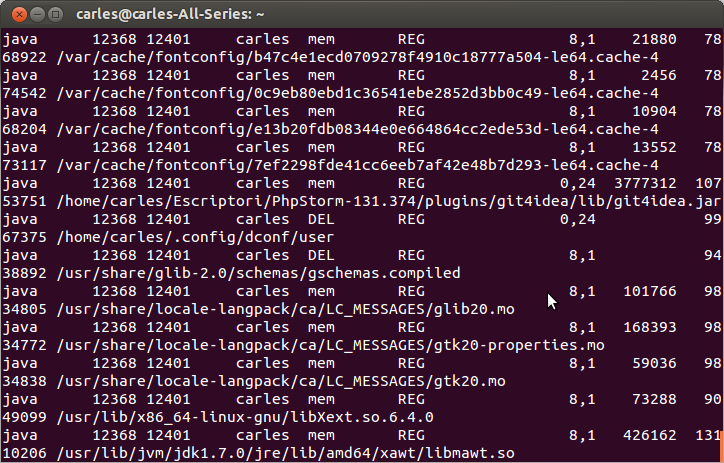 That means that you will see the requests from the program to the kernel to open a file, for example a config file. Here we can see what files were open, the mode and the result. So if your program failen opening a certain file you will see it on the traces. You can specify to trace only certain set of system calls by passing parameter -e trace=open,close,read,write,stat,chmod,unlink or -e trace=network or -e trace=process or -e trace=memory or -e trace=ipc or -e trace=signal etcetera. You can also trace libraries with ltrace or processes with ptrace. 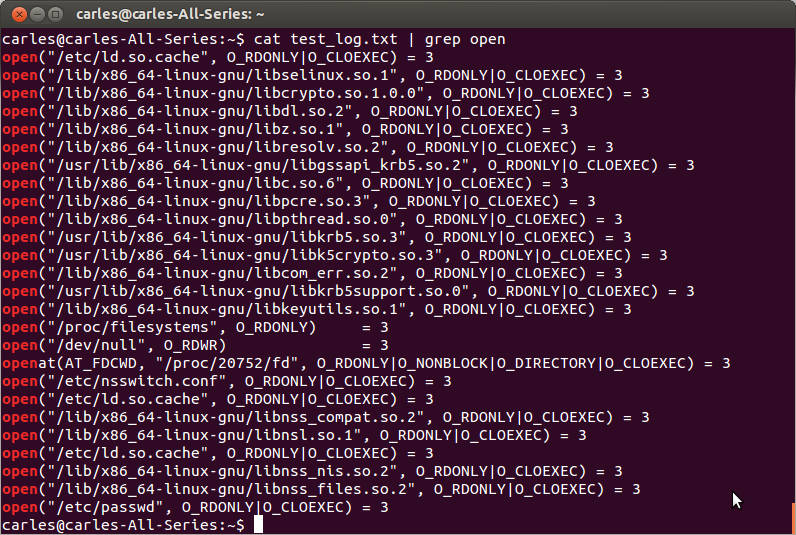 And see the open files with lsof. Take a look at ss for advanced sockets inspecting. Of course you will find very interesting info on /proc pseudo-filesystem. Where 1714 is the process id, whatever. /proc/[pid]/fd/ is a subdirectory containing one entry for each file open by the process, named by its file descriptor, being a symbolic link to the actual file. /proc/[pid]/fdinfo/ will show information on the flags for the access mode of the open files and /proc/[pid]/io contains input/outputs statistics for the process. 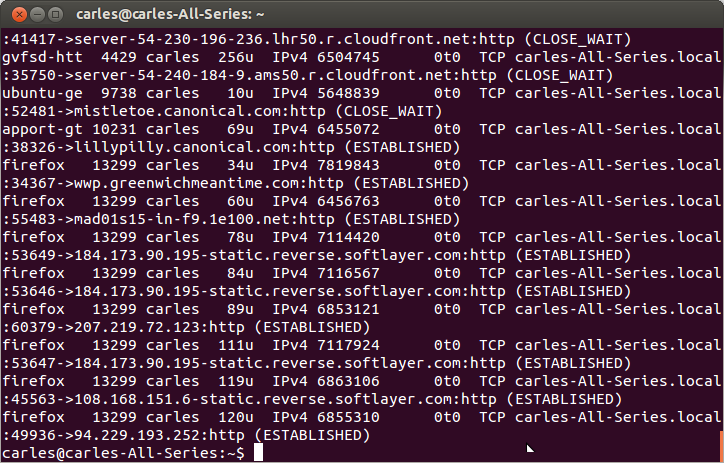 This entry was posted in Performance, Troubleshoot and tagged debug, lsof, ltrace, strace on 2013-11-22 by Carles Mateo.